A huge thank you to Buena Park for hosting us and providing us access to all of the adventures! California, the land of sun and sea where nestled in the heart of Anaheim you can find Buena Park. I had heard of Buena Park before but never knew what was there if anything. Little did I know that there is a ton of attractions and activities within reach! So in mid-September we packed up our bags and headed out to spend a weekend in Buena Park and we couldn’t have made a better decision. Our first stop in Buena Park was to drop our things and relax for a little while. While visiting Buena Park we stayed at the newly remodeled Holiday Inn. From the outside it looks like any other Holiday Inn but as soon as you walk in you get to witness the multimillion dollar remodel. From the new tile to the beautiful lighting, you get a gorgeous first look. We were promptly help at the front desk and given directions to our room. Once we entered our room we found a comfy set of double beds and gift bag full of goodies. I will say though, even though we had a fantastic view of the pool and our room was nice, the parking is a bit difficult. There are very few parking spots that are easily accessible to the elevators. The rest are a bit of a walk but nothing to deter us from staying so close to all of the attractions. I have two very rambunctious boys who go stir crazy in hotel rooms so exploring attractions that allow them to burn their energy is a must. The Big Air Trampoline ParkPIN IT! was the perfect place to get their wiggle worms out! Big Air was really awesome, even as an adult. They have trampoline sections where you can jump into foam pits, slam dunk basketballs, dodge ball areas, open jump area, and best of a all a toddler play area. That means my little man got to “jump” his little heart out too without being trampled by older kids in the open jump areas. All the areas had referees keeping watch for everyone’s safety which was fantastic. Once we jumped until our legs gave out, we headed over to the little food court to grab some snacks. In a nutshell, the staff at Big Air were fantastic. They were friendly, full of helpful guidance, and honestly seemed to love their job. When a company has happy staff you know its a great place to be! Just a few miles down the road from our hotel are a variety of beaches. I heard Seal Beach is great for sightseeing but Huntington Beach was just calling me. We threw on our swimsuits, packed the sand toys, and headed out. It took about 20 minutes to get there with traffic but the beach was beautiful and not too crowded. We grabbed some mouth watering Mexican food at Sancho’s TacosPIN IT! then headed down to the shore to soak up some vitamin sea. 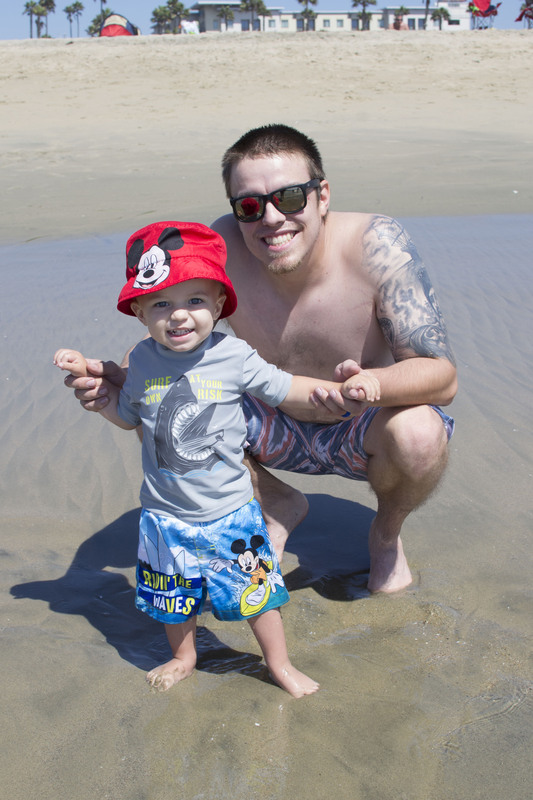 My boys loved playing in the water and sand for a couple of hours. If you’ve ever visited Medieval Times then you know what its like to attend a dinner show. Now let’s change the scenery to a smaller, up close, water surrounded ship! Our food started as soon as you walked in the door with a variety of appetizers being served and a full bar to order drinks. They had my current fave, Ace’s Pineapple CiderPIN IT! on draft so I couldn’t say no to a beer. They have a couple little open shops to grab some cheap souvenirs. I mean, really cheap. I grabbed a stuffed turtle and foam sword for my boys and it was $10. Once the show was ready to begin, you had to wait for your pirate to be introduced to be taken to the ship. We had great seats in the second row and our oldest son as well as my husband was asked to volunteer multiple times. My oldest thought it was the coolest thing ever. Our dinner consisted of salad or soup, a quarter chicken(endless! ), a shrimp kabob, mixed veggies, and mashed potatoes. The food was all really good surprisingly and our “wenches” were on top of handling all of our needs. Though I’ve been to Medieval Times, experiencing the Pirate’s Dinner Adventure was a great change. It was full of sword fights, humor, and gorgeous aerial silk dancing. Our pirate was interactive and really got our section into the show. I highly recommend checking this dinner show out! Being 1-2 miles from our hotel to Knott’s Berry FarmPIN IT! was a huge advantage that we were ready to take on! I’ve been to many theme parks in my life but never Knott’s Berry before so I was excited to see what it had to offer. Before we were shuttled to the park, I checked out everything online. I found awesomely discounted drink and food options that you want to purchase BEFORE getting there. You can purchase the same items once you get there but the pricing is higher. Since we already had our tickets we were able to go in rather quickly. My oldest wanted to get on the water rides first so we went through ghost town and got soaked then it turned into a frenzy of excitement as to what to ride next. Since my youngest is almost 2, we made sure to check out Snoopy Land which was perfect for toddlers! They had a ton of little rides that were just his size and he couldn’t get enough of them. The semi truck “rollercoaster” was hands down his favorite. We ran around from ride to ride for 9 hours! Yes, 9 whole hours and still didn’t get to fit in every ride. Knott’s Berry Farm was a blast and though some of the lines were long, it was nothing compared to other parks that I had been too. Not to mention the food was way better than what I expected at a them park. Tacos. Do I need to say more? Our last day in Cali we dedicated to visiting John’s Incredible Pizza CompanyPIN IT!. I assumed it was going to be similar to Peter Piper Pizza like we have here but it was so much more than that. After paying admission you choose a themed room of your liking to eat in. Then you get down to business with a wide variety of eating options. They had salads, pizza, pasta, fried chicken, tacos, soups, and more! They even had a bar, soda fountains, coffee bars, and ICEE machines so everyone could drink whatever they pleased. Then once you feel like you’re going to burst, you have to check out the dessert bar filled to please any sweet tooth. After eating more than we care to admit, we headed over to the game section to have some funs. 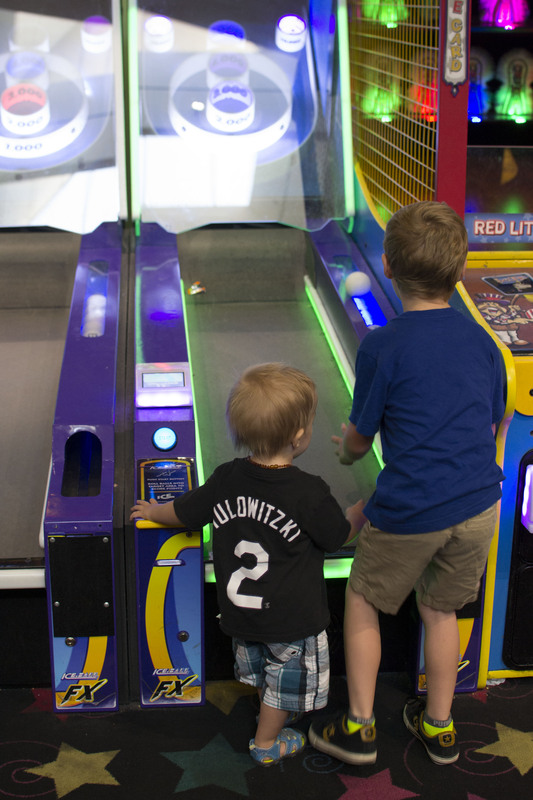 They had a ton of games to play as well as younger games that my toddler could enjoy. The best part is that it only costs about 2-3 digital coins a game which lasted all 4 of us about 2 hours of play. Then we were able to cash in our tickets for prizes which came out to 3 prizes for each of the boys. Now that I’ve experienced John’s, I’m really sad that we don’t have one here in the valley. This would be a most welcomed addition for kids and adults alike to enjoy. So if you’re ever near one you have to stop and experience the food and fun! Have you ever visited Buena Park? What was your favorite attraction? Buena Vista is so lovely. I would love to take the family there for a trip. Thank you for sharing this gem. I’ve always wanted to go to Buena Vista! Seems like a great getaway! Looks like a ton of fun. The pics really bring it to life. This place looks like so much fun! My kids would have a blast. My daughter loves those foam pits. What a wonderful weekend. There is certainly a lot of fun things to do. I want to spend a weekend there too! Looks like a really fun place. My son would love it. Looks like you had a great time and went to some fun things! What a great weekend! Wow, it sounds like Buena Park is the absolute perfect place to spend some quality family time. 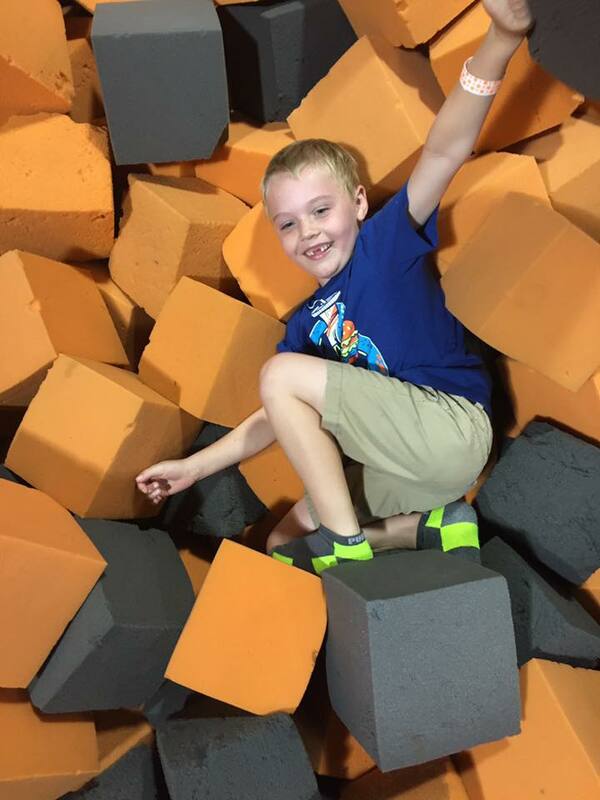 My boys would have absolutely LOVE the trampoline park–it looks like an absolute blast! So many fun things to do there and obviously all just had fun. Interesting place! Sounds like a great weekend!! I love when we are able to do a weekend like this with the kids! I want to go!!!! That looks fun even for an adult weekend trip!! That looks like a lot of fun. This would be great for my family. My girls would love it there. That is such a fun place for the whole family. We’ve never been there, but we certainly would love to go! Buena Park looks like so much fun. I will have to check it out when I am in the area next time. My kids would love it. This looks like it was a fun weekend! I would love an adventure right now! The trampoline park sounds like so much fun. My boys would enjoy it so much fun. I also would love to take my boys to Knotts Berry Farm one of these days. I haven’t ever been to California. I hope to be able to visit one day. This place looks so lovely! I have never been to California, but it is definitely on my list of states to visit someday with my family. How fun! This looks like such a fun place to travel with family – looks like you guys had an awesome time, too! No way, this looks like so much. Honestly those 3-4 day vacation really makes the year go smoothly. Wow! This vacation is a blast, what a fun experienced for your family! I bet my son will enjoy diving in a trampoline park. This is a travel must-see place. My son will enjoy a weekend there. Aww this is so much fun! It looks like you guys were having so much. I haven’t been to knotts in a while but now I so want to go. I used to live near there and we would go to Knott’s all the time. We always ate breakfast there too. Lots of great memories. Now I live in Chicago and I hope to take my kids there someday. Our trip out west in a few years might end up having to be the whole summer. There is so much to do and see. Incredible Pizza is definitely a fun place to visit. It looks like your family had so much fun! What a great place to visit! I have always wanted to visit Knott berry farm.. I think my kids will love it! That looks like so much fun! Kids and parents both can have a blast. We haven’t visited before. It really seems like a great place to have a fun family weekend! Everyone looks like they had such a great time. I would love to take a visit here one day. It sounds like a perfect place to hang out with the whole family. I will definitely consider this on our next family adventure. Thanks for sharing!